Fall is here and that means it’s time for pumpkin flavored treats, chilly evenings, football games, and tons of leaves to rake. Fall is the perfect season to get out and engage in some frugal entertainment and activities with your friends and family. Keeping your entertainment budget low during the fall will help you be able to prepare for the expensive holiday season shortly after. 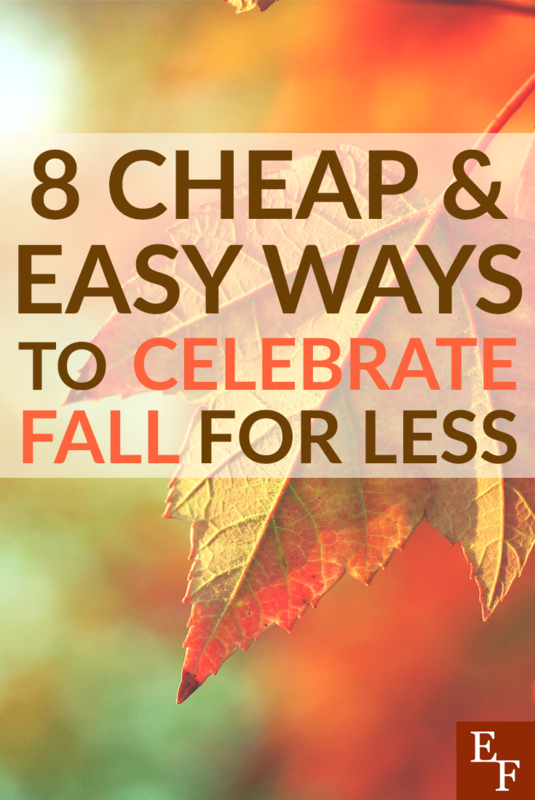 If you’re looking for some fun ways to celebrate fall that won’t drain your wallet, consider some of these frugal activities to enjoy together. Decorating your home doesn’t have to be a tedious process that you need to check off of a list. It can be a time to get creative and festive with family and really set the mood around your household for the fall season. You can create candles together, decorate pine cones that you find outside or have the kids pick up, and trace leaves on construction paper to cut out and tape on the windows. If you’re not the best at coming up with ideas, you can always stop by your local library to see if they have a craft theme with supplies and directions that you can put together. Or check the calendar at your local Michael’s store to see if they have a seasonal craft event that you can attend with your kids. Michael always has fun crafts lined up during each season and last year I only spent about $5 so my son and I could paint and customize an artificial pumpkin. Visiting the apple orchard or pumpkin patch can be fun no matter how old you are. There are lots of things to explore including games, obstacle courses, hay rides and of course apple picking and the yummy fall-themed treats. Some local farms can get costly, especially if there are special events going on. The key is to go during the weekend or on a free day and not go overboard with all the merchandise in the gift shops. Some locations are free on weekends or may provide coupons and discounts on admissions. Do you live near a college? Colleges and universities have tons of themed events year-round. College football games are much less expensive to attend as opposed to professional football games. Even though lots of students and alumni attend, most games are geared toward families and offer lots of family-friendly activities to partake in before the game starts. You can also check the calendar at your child’s school to see if they have any fall-themed events. Family events and festivals hosted by schools almost always are free or extremely low cost. Plus, it’s a great way to get out of the house, meet up with other friends and neighbors and avoid spending lots of money. Grab a bag of trail mix, some water, and bring the whole family to a state park for some hiking. Most state parks are free so you can explore some natural attractions and even go fishing or pack a lunch for a picnic at the park if you want to. I went camping in July and it was uncomfortably hot. This made me realize I’d much rather go camping during the spring or fall. Camping is such a cheap and relaxing activity and a great experience to have with friends and family. Plan a weekend getaway at either a local or destination campsite. Pack your own food, snacks, and some entertainment items like card/board games, fishing supplies, etc. I love fall festivals. If there’s not one in my town, there’s one in a nearby town and it’s usually free or cheap to attend. There are often contests, arts and crafts, live music, and lots of tasty fall treats and drinks to try. Some festivals even have a petting zoo or horseback riding which is great for kids. If you want to do something fun and frugal on a nice weekend in the fall, try to make to at least one fall festival for all-day entertainment and fun. I’ve never carved pumpkins myself before, but this year I want to change that. I usually buy pumpkins for decoration and to cook with. I realize how it could be really fun to turn on a movie one night and carve up some pumpkins with my family. If you buy small to medium-sized pumpkin for carving, you’ll only spend a few dollars on each. You can use kitchen supplies you already have for carving tools, then just get creative. Whenever I cut up a pumpkin, I like to pick out the seeds and wash them for roasting later. If you haven’t tried roasted pumpkin seeds, you’re definitely missing out. Don’t forget about Halloween. Whether it’s a parade, party, pumpkin carving contest, corn maze or early trick-or-treating event, try to get involved in the festivities somehow. In some towns, local businesses get together and allow kids to trick-or-treat early at their stores and make an event out of it. You may even be able to snag coupons for a haunted house. Halloween events only come around once a year. Find out what’s going on in your area and mark your calendar so you can celebrate fall. Don’t miss out on the fun! Do you have any fun plans to celebrate fall this year?